This has one of my favorite pictures so far; the one where Dan has removed the tape covering the bridge area and exposing the bare wood beneath. It is a perfect detail; illustrating the bare wood versus the end result. As I told my son, it's a "start to finish picture"....literally! 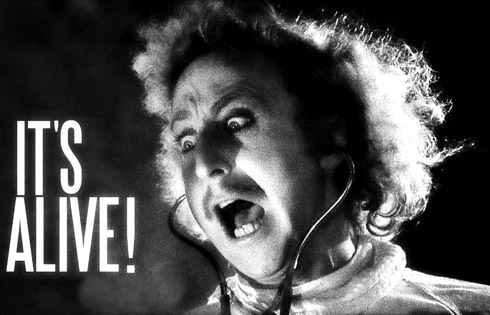 Subject: It's Alive! IT'S ALIVE!!! The title pretty much says it all. I'll glue the battery holder and pre-amp face plates on tomorrow, then take some proper beauty shots, either tomorrow or Saturday. How does it sound? I like it. I think you're going to like it too, Patch. It's a warm, pleasant sounding guitar. Acoustically, it's definitely a guitar for intimate settings. It wouldn't do well against a banjo, for example. I plugged it into my little practice amp and it sounds great. Right now, I've got D'Addario EJ43, light tension strings on it. Because I've never built a guitar with a redwood top, I decided to start with light tension, then work my way up in tension until I find the guitar's sweet-spot. It can definitely use some higher tension strings as the treble is a littel quieter than the bass. I'll leave these strings on for a day or so, then move up to the normal tension, etc. Location: Indy Really stunning. Patch has another one of a kind. Location: What week? Yet another fine product from Savage Laboratories! That is SO pretty. On strings, I just installed some EJ45 D'Adds and they aren't behaving very nicely at all. Over two weeks now and they are still settling in daily. Has anyone here had good results with Martin mediums? I think I'd like to try a set. It's just an old CC-013-4, but it's in great shape and I want it to sound better. And I might even bite the baby bullet and try some ball ends. Any opinion on those? But no matter what I do, it won't even shine a dim light on this beauty of Patch's. Excellent work, Dan! Oh.. PS: One reason I want the ball ends is because a small piece of the white ring around the bottom edge of the anchor of the bridge broke off with the crack being directly under the bass E string. I was able to glue it back on, but with all that pressure on the crack, the end tip may pop off again and get lost and I don't want the string curving up tight against raw wood. Does anyone have one of those in their parts box? Location: Boise, Idaho Beautiful. Your work is inspiring, although I'm not inspired enough to change the long overdue strings on my 1713. I also have problems getting nylon strings to settle in. It may be at least partly my poor technique, but it also seems like they stretch forever. Or they stretch until it's time to change them. I know this is a one-off guitar, but even any type of parlor, nylon string, redwood top guitar must be pretty rare, right? Location: Lake Forest, CA Thanks for the kind words, everyone. I'll probably change out the EJ43s for a set of EJ45s. Yes, redwood-topped guitars aren't really rare, but they are a little uncommon. What is rare in our world is a redwood-topped A-braced nylon string guitar. The A-braces are usually reserved for steel string Os. But, it still sounds pretty good with the nylon strings. It just needs a little stronger presences on the unwound strings. The bottom three wound strings sound great. They have almost as much sustain as torrefied spruce. Almost. Location: SoCal Any chance of a swing by tomorrow between 1-1:30 to have a look? Location: Yokohama, Japan Amazing work Dan! You're setting a high standard for the BFLG! Bautiful and inspiring. The Redwood A-brace combination is really interesting for a nylon stringer. Hope you have a chance to post a recording. Are you planning on Prime Vibing this beauty? Again, thanks for sharing! Amazing work Dan! You're setting a high standard for the BFLG! I'll second that. Fantastic work Dan. Very inspiring. The Redwood A-brace combination is really interesting for a nylon stringer.! It's not the first time. My 1713-X from the factory is also A-braced backing redwood. It's wonderful, but Dan is right in that the bass can over-power the trebles. I have high-tension D'Addarios on mine, but am open to other ideas. I am curious about what he discovers with his string experiments. So far, the combination I like best on this guitar is EJ45 on the three treble strings and EJ43 on the three bass. It gives a really nice balance between the treble and bass response. Paul Moody came over to day to play with Patch's new toy. Location: SoCal This is a really wonderful little guitar. The Ovation parlor size, either as the slothead collectors or as the paddle head parlor the following year, were under appreciated. They have a bigger sound then they ever should have given their size. But this guitar has a full warm sound, and the country artist neck fits the body well. I would be very happy to have this guitar on a stand next to my reading chair. Dan shaved the top a bit from Ovation's norm and it makes the top very lively, producing that great sound. I always felt that Ovation was building guitars for the rigors of the stage/road. Durability was important. Dan shaved the tops on my Legend and my classical and the resulting sound is wonderful (and I have medium strings on the Legend and high tension strings on the classical. Neither shows any sign of stress in the tops. Location: What week? Sounds great! And to Paul a nice job on putting it through the paces (though the bird was out of key). I'd be giddy to have this guitar! Location: Canada And another fascinating project to follow was completed. Congratulations to Dan and Patch. Location: Boise, Idaho Beautiful job again, Dan. My 97 Collector isn't nearly as pretty, but I still think it's cool. And I agree with what Paul said. They play a lot better than they should. And another fascinating project to follow was completed. Congratulations to Dan and Patch. Location: Lake Forest, CA Thanks, everyone. I've been playing the guitar and it's a pretty cool guitar. It responds to every touch. If you want to play it quietly, it's got a soft, sweet sound. Surprisingly, you can really hit it with a strong rhythm strumming and the top doesn't sound like it's being over-driven like how cedar can sound when you're too aggressive with the attack. The strings are getting pretty tired with all the tuning/de-tuning I've been doing. I'll change them out in a day or so for the EJ43/EJ45 combo I liked, then send it along to Moody. In what order do you stack that combo? EJ43 on the three bass strings and EJ45 on the three treble strings.